As much as you need to clean and organise the rest of your home when preparing for house guests, it is the guest room that requires special attention! While it may not be a 5-star hotel room, nor do your guests expect it to be one, the least homeowners can do is to make the room as clean, tidy and comfortable as possible. There are a lot of things that make a guest room more homely and appealing than other bedrooms; this starts with the basics and ends with a few final touches to make up the perfect guest room! So, if you’re wondering how you can impress the next person that spends a few days with you, read on to find out our top seven things to do for the perfect guest room. 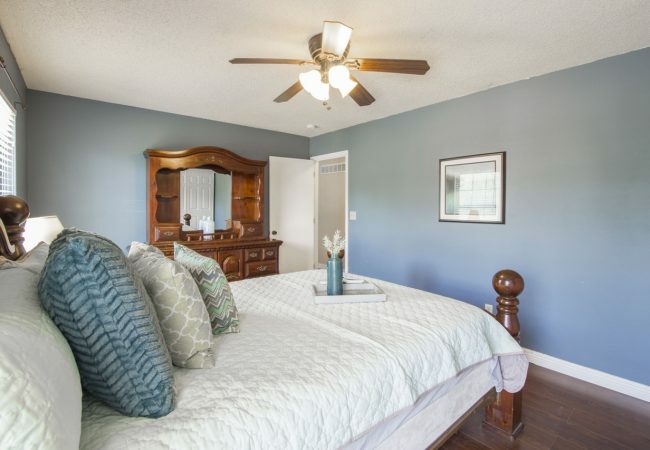 Of course, every room is unique and is likely to contain additional furniture pieces and other items; therefore, it’s important to look around your guest room and clean any space where dirt and dust may be hiding. Fresh sheets and clean curtains (or blinds) are two of the obvious ‘musts’ for a guest room; however, the colours and patterns of the fabrics can impact the rest of the room in a dramatic way! For example, if your house guests are elderly people, pick earthy tones that make the room appear more sober. On the other hand, bold, funky colours and patterns are perfect for close friends with bubbly personalities. Apart from this, make sure that there are enough blankets and pillows to keep your guest comfortable. Even if it’s a shelf or two, it shows a great deal of thoughtfulness and hospitality to provide some closet space for your guests to put their clothes and personal belongings. Free a sufficient amount of space depending on how long your guests will be staying with you. It’s rather inconvenient to live out of a suitcase; hence, your guests will definitely appreciate the storage space! Make sure that there is space for your house guests to keep their shoes, handbags, jackets, etc. so that they can also maintain tidiness in the room. When there isn’t adequate space for these items, your guests will be forced to dump stuff on the bed or dresser which will make them feel guilty for ‘messing’ up the room! So, make arrangements for as much additional space to help keep the room neat and organised while your guests are staying with you. Your guests may not be comfortable with sneaking into the kitchen for a midnight snack without your knowledge. So, instead of letting their rumbling stomachs keep them up, place some snacks in a basket or tray and leave it on the dresser for them to eat whenever they’d like. These snacks can include an assortment of nuts, wafers, fruit, etc. It’s also nice to keep a bottle or jug of water with a glass (or two) in the room so that your guests aren’t inconvenienced if they get thirsty during the night. For the final touches, add some fresh flowers to the room to beautify it and give a sweet smell! Of course, if your house guests suffer from allergies or asthma, you may want to opt for fake flowers or consult with them before picking up a bunch of fresh flowers that are allergy-triggers! With that, we guarantee that your house guests will enjoy every minute spent in their perfectly made up guest room! Next Post: Spring Cleaning Challenge – 6 Days That Will Transform Your Home!